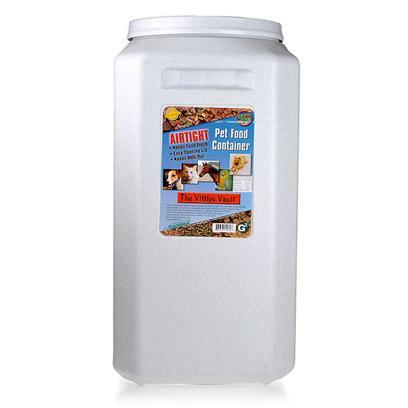 Airtight STORAGE SOLUTION PET FOOD. TURNS INTO AN ELEVATED FEEDER WHEN PLASTIC DISH (INCLUDED) IS PLACED ON TOP OF LID. HEAVY DUTY, KEEPS PESTS OUT, SEALS IN FRESHNESS. RAISED PAW PRINT DESIGN ON ALL FOUR SIDES. INCLUDES FREE MEASURING CUP AND FEEDING DISH. WARM GRANITE TONE, 6.6 GALLON CAPACITY, HOLDS 25+ LBS DOG FOOD. 5.5" x 5.5" x 11.25" tall with molded handle. 14" x 14" x 28" tall with molded handle. 14" x 14" x 20" tall with molded handle. 14" x 14" x 13" tall with molded handle. 12" diameter x 18" tall with molded handle. 12" diameter x 12" tall with molded handle.